GIS combines place with time so brokers can better understand trends in the commercial real estate market. 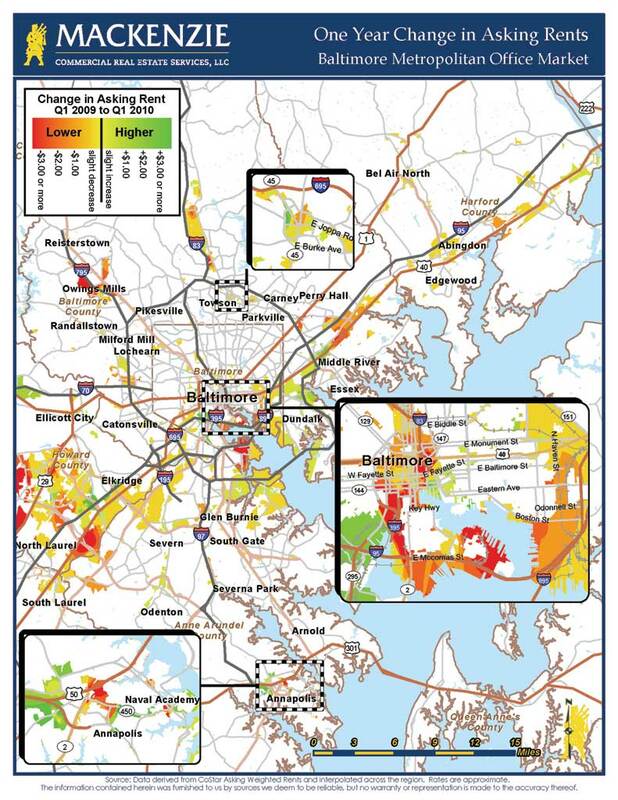 This heat map displays one-year changes in asking rents for the Baltimore market. Bright green areas indicate rising values and dark red areas indicate deep declines. As a company dealing with buildings and space management, MacKenzie Commercial Real Estate Services has relied on maps to view information for the past 20 years. However, it wasn't until the company incorporated Esri Business Analyst software that MacKenzie's agents really understood their commercial holdings. Business Analyst and Business Analyst Online (BAO) are now used at the company every day to understand and analyze vast amounts of data. Today, MacKenzie Commercial Real Estate Services uses Business Analyst for all stages of the commercial real estate life cycle at the company, including development, landlord representation, tenant advisory and site selection, market research, construction, and property management. The software has even helped the company offer services to new customers who were not interested in real estate transactions. MacKenzie is one of the largest commercial real estate firms in the Baltimore metropolitan area, with more than 140 associates and offices in Annapolis, Baltimore, Bel Air, Lutherville, and Maple Lawn, Maryland. When the company first began using maps to view data, the process was cumbersome and time-consuming. MacKenzie staff would pull aerial photographs off the web, use Adobe Illustrator to plot listings, then draw road and highway labels by hand. When Matt Felton was hired as the director of research for GIS and mapping, he introduced the company to Esri Business Analyst. Staff now had access to the vast amount of data included with the software such as retail information, consumer expenditure segmentation data, and market potential indexes. This map reveals customer behavior that can be used to identify optimal locations for new health care facilities and evaluate the locations of existing sites. "For the first time, I think members of my company really saw their real estate," Felton said. "We had a lot of fun with the data, viewing and exploring information in a way they hadn't experienced before. The more they saw in the maps, the more questions they would ask." No stranger to GIS, Felton previously served as a director at Towson University's Center for GIS. 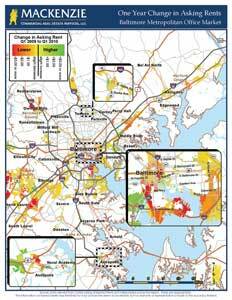 The center's staff are GIS consultants to government organizations and private businesses in the mid-Atlantic region. While at the center, Felton worked in many disciplines: homeland security, transportation, economic development, land planning, natural resources protection, public safety, and emergency management. The one area Felton hadn't experienced was commercial real estate. "I was drawn to the frontier of applying GIS as a common operating picture in a discipline that is inherently location," he said. Felton left Towson and joined MacKenzie right when the economy took a turn for the worse. "Probably not the best-timed decision," Felton laughed. "But in hindsight, I couldn't have planned it any better. Just when things got really competitive, I had a tool that gave us an enormous advantage." Felton heads a team that actively supports about 40 MacKenzie brokers who have mapping and data discovery needs. These needs vary depending on the type of client being served. BAO is used to create quick reports that are often used to investigate data downloaded from real estate information data providers such as CoStar. When simply exploring a location is important, brokers can use ArcReader to view, discover, and print maps on their own. ArcReader is a free, easy-to-use desktop mapping application from Esri. For more in-depth analysis, Felton's team uses Business Analyst and Esri's Tapestry Segmentation data to characterize neighborhoods for clients. "Maybe we are working with a company that sells suits," explained Felton. "We can show them where the people who buy suits are located based on the psychographic profile of their customers." Whether the task is to simply plot a listing or provide a more in-depth analysis of the market, there are replicable steps that every broker follows. First, an area is identified based on available space, high market potential, or other criteria that is important to the client. Once the area is selected, the broker identifies potentially suitable buildings or offices and performs analysis to determine if the site will support the selected criterion or reveals any hidden opportunities. 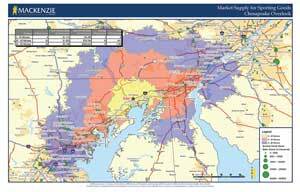 Local information, such as tax maps, are brought into Business Analyst and overlaid on aerial and plat maps for a more accurate, timely view of a location. "Brokers used to spend hours at the courthouse trying to locate the proper tax map," said Felton. "Now—in 15 minutes—a broker can pull up exactly what is needed over the Internet and display it on the desktop." 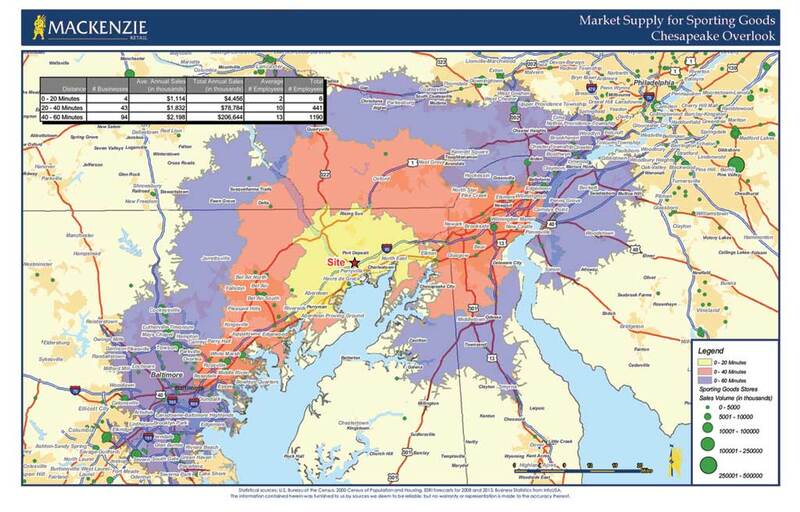 Combining market areas (20-, 40-, and 60-minute drive times) with business volume data to understand existing market supply for sporting goods and related products helped determine if a large sporting goods store at a new site in Perryville, Maryland, was viable. This map-centric view of the data allows the agent to click on a property that is of interest and automatically be taken to the state assessor's web page for the property. "This is often much easier than trying to search the online database," explained Felton. "Often, an undeveloped parcel has not been given an address, and our search allows the agent to zoom to the area of interest and click for information." Once a site has been identified, the agent can explore that area by layering data from hundreds of other layers including zoning, tax incentives, floodplains, nearby businesses, and traffic counts. "GIS enables us to combine Esri's rich collection of data with authoritative data from state and local government organizations and with our own local market intelligence," Felton added. MacKenzie's brokers can nimbly combine this data to help their clients make more informed and timely decisions. Another advantage? The broker is seen as an expert. "At the same time our brokers are on the phone with a client, they can be finding the property and all the information about it—who owns it, how it is zoned, and how much traffic passes by. They can then create a map layout quickly and e-mail it instantly to the client while still on the phone," said Felton. "GIS enables our agents to be real smooth." Speaking of smooth, Felton has put GIS to use during board meetings and client presentations. Using ArcGIS Explorer, another no-cost viewer from Esri, MacKenzie agents are able to give tours of potential sites—virtually. Agents can instantly narrow down what might be an extensive list of prospects to those that will really pan out. When a national board of directors was considering relocating its headquarters to a another city, MacKenzie's staff treated the directors to a digital fly-through of each potential site including 360-degree, bird's-eye, and street views of each location. The cost, amenities, and terms for each building were also available and could be queried in ArcGIS Explorer. The directors were able to narrow down their options from 30 to 3 before making the requisite site visit. "Instead of spending an entire day with a bunch of sweaty people in suits in a van, we were able to narrow down our search sitting comfortably in a conference room and only spend a few hours touring the sites that were really of interest," said Felton. "Time and resources are limited. GIS enables us to do the most with everything we have available to us." Another application is the company's innovative approach to landlord representation. GeoProspector, a solution the company has created based on Esri's ArcReader and ArcExplorer, helps brokers more effectively search for tenants. GeoProspector combines multiple layers of information, such as streets and office buildings, into an interactive map that is organized by a status grid. Based on the color of the building, brokers can methodically search the grids for potential tenants or buyers, ensuring that they exhaust all possibilities before moving on to another region. "Instead of going down a long list of prospects, our brokers can work each map area, ensuring that they are effectively canvassing the entire market," said Felton. "GIS has definitely made our company more efficient and has been an invaluable tool for making smarter and faster decisions. We use it on the front end of the process to cull through a lot of data and to help our clients make the best choices possible, then we use GIS on the back end to communicate those choices to stakeholders in a very compelling format." GIS has also helped MacKenzie branch out and offer new services to clients, even if there is no real estate transaction involved. The company has been assisting a regional hospital with a strategic plan for a new outpatient facility by performing an analysis of the market demand for existing health care, current facilities, number of patients, and other aspects of developing the plan. 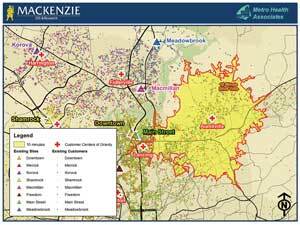 Using Business Analyst, MacKenzie's staff are able to ask what-if questions and model different scenarios. Would it be better to consolidate existing facilities, relocate those facilities, or open new facilities? Called a GeoStudy service, it is available to any organization. 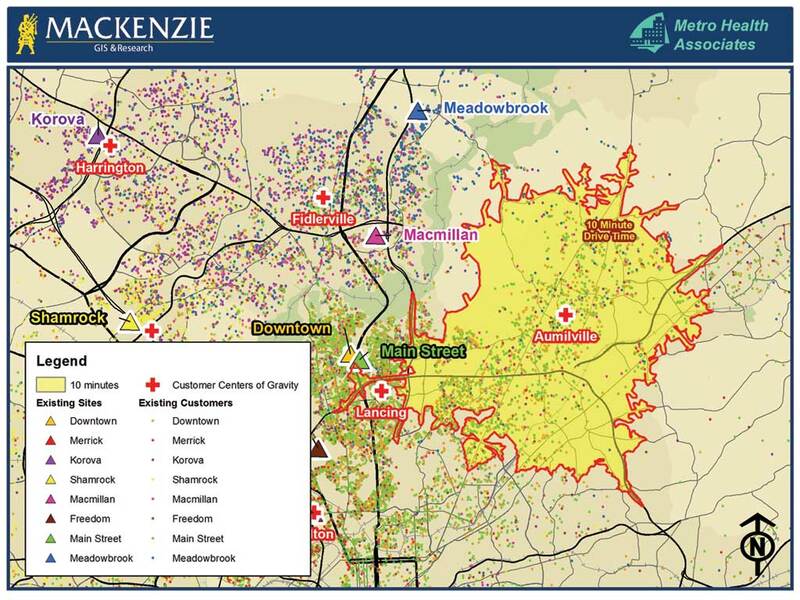 Business Analyst and Business Analyst Online are helping MacKenzie integrate the data—property values, location information, zoning data—commercial real estate brokers need to make informed decisions quickly. Integrating this information into one common platform provides a persuasive communication format that enhances collaboration between landlords, tenants, investors, developers, property managers, and brokers.